The humans discover a Kobolian ark on the primeval surface of Earth; Count Iblis offers Baltar his help in defeating the humans. The "What Has Gone Before..." blurb on the inside front cover remarks that Count Iblis has returned after an absence of 20 years. Of course, taking the Hatch novels into account, it has been far less than 20 years since he last menaced the fleet. Baltar now has long hair pulled back into a ponytail! On page 7, Iblis takes on a semi-demonic form in his confrontation with Baltar. He looks quite different than the image seen when penetrated by the laser blasts of Starbuck in "War of the Gods" Part 2. Iblis' demonic form in "War of the Gods" Part 2. Iblis' demonic form in this issue. On page 7, Count Iblis' version of how his voice came to be that of Imperious Leader's is not too far off from what is revealed in the Hatch novels. On page 8, Earth is referred to as being in Quadrant Alpha. This harkens back to the description of Earth's location given to Apollo, Starbuck, and Sheba in "War of the Gods" Part 2. This issue reveals that Tigh is now the President of the Council, just as he was in the Hatch novels. 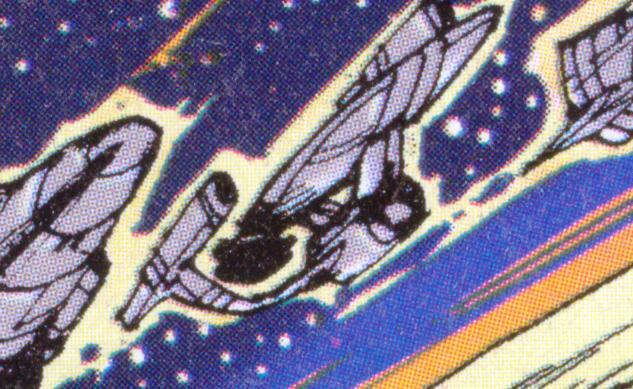 He is depicted as completely bald at this time, the Colonial yahren 7362 according to "War of Eden" Part 1. On page 8, Commander Apollo speaks to Sires Domra and Montrose. Domra previously appeared in "Baltar's Escape" and Montrose in "War of the Gods Part 1". In the flashback of Boomer, Starbuck, and Box's discovery of the Kobolian ark and encounter with a dinosaur on page 10, Starbuck is depicted smoking a fumarello. But in the original scene from "War of Eden" Part 1, he was not smoking. On page 11, notice that Dr. Cyrus has a patch on his shoulder depicting a top-view silhouette of a battlestar. On page 14, President Tigh remarks that Sire Domra has wanted to end the state of martial law in the fleet for yahrens. Indeed, in "Baltar's Escape", he tried to do so. On page 18, Count Iblis shouts to the Seraphs, "...no one has dominion over me..." He said these same words to Sheba in "War of the Gods" Part 2. On page 20, Box is sitting in a park-like area under a transparent dome with Muffit. He must be on the agro-ship. And this is the first appearance of Muffit II since The Death of Apollo mini-series; the mechanical daggit was not seen at all in the Hatch novels, though he was mentioned in the past tense a time or two. Page 22 reveals that Sheba retired from the Colonial Service when she married Apollo. Now that the fleet has reached Earth, and with their son Cain growing into a man, she decides to rejoin the service, born to be a warrior like her father. 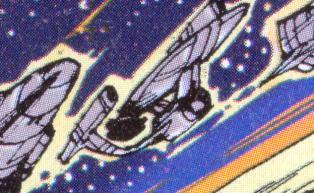 On page 24, one ship of the fleet looks suspiciously like some type of Starfleet vessel from Star Trek! Page 26 mentions "maxon fluid" as part of a cryo-suspension process in which Commander Adama was placed 15 yahrens ago. This is the first mention of maxon in the BSG universe.